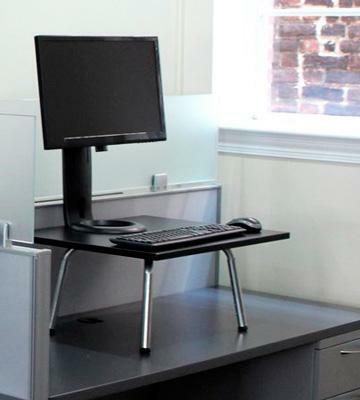 Thanks to a built-in motor, the standing desk moves up and down at just the press of a button. 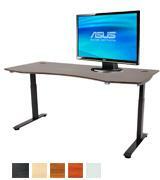 This is a premium desk allowing you to move from a sitting to a standing position whenever you want. 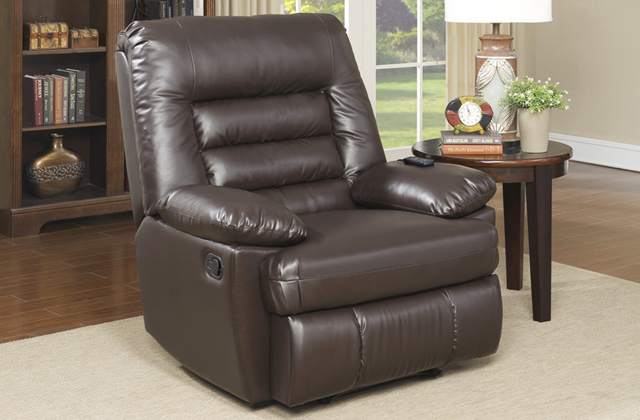 The best option to create a comfortable and healthy workplace at home or in the office! 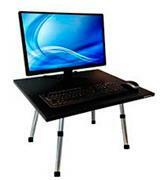 Adjustable from 24" to 50"
X-elit Pro (air pump) system will smoothly and silently lower or raise the desk top. Manual adjusting up to 5". X-Elite converter is a roomy workstation for your laptop/monitor, keyboard, mouse, notes, sketches, cups, etc! 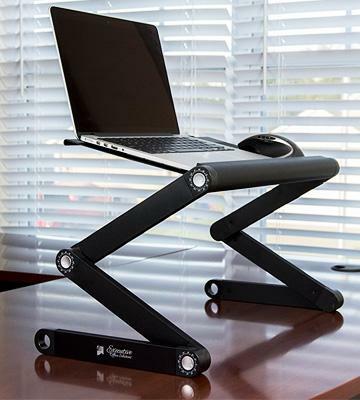 An excellent solution for working or studying both in sitting and standing positions! This two-tier desk ensures the most natural standing position. Plus, wheels will help you move the desk. The height adjustment requires additional tools. The wide desk top and back-tilt keyboard tray will make computing comfortable! 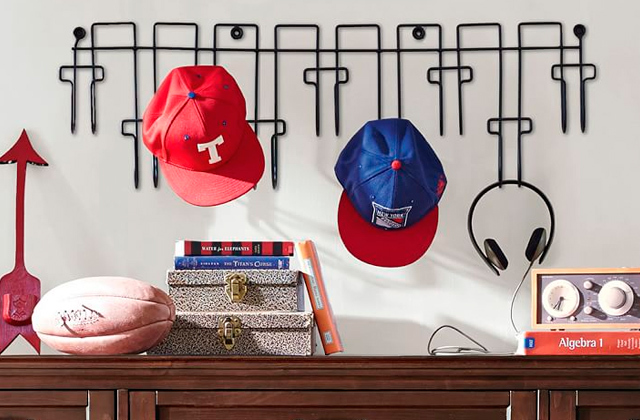 The desk can hold lots of accessories, thus, is perfect for everyday use. Desk top: 39 1/2" х 14"
Keyboard slot: 39 1/2" х 16"
Keyboard slot: from 28 1/2" to 40 1/2"
The rubber feet prevent sliding and ensure stability on any surface. Might not suit really tall people. 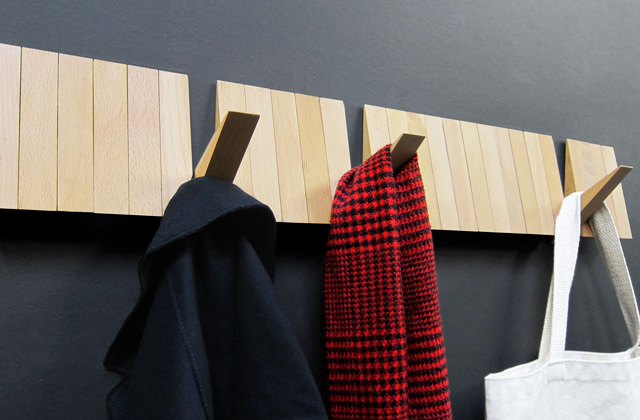 Want to make the most out of your cubicle? If so, get this ergonomic standing desk to optimize your workstation. 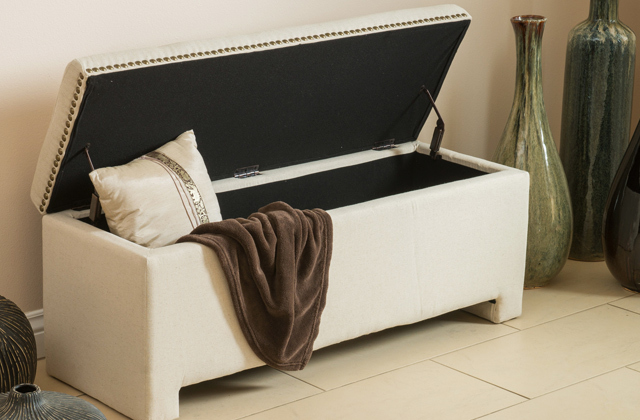 It also assembles easily, you'll need no more than 5 minutes to set it up. Adjustable from 11.25" to 15.25"
Due to Lift Up mechanism, users can adjust the incline of both legs and top for the most comfortable work. 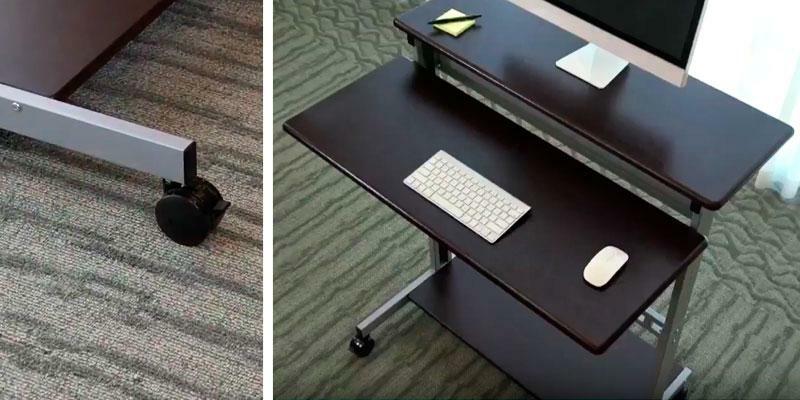 The desk can hold one laptop only. 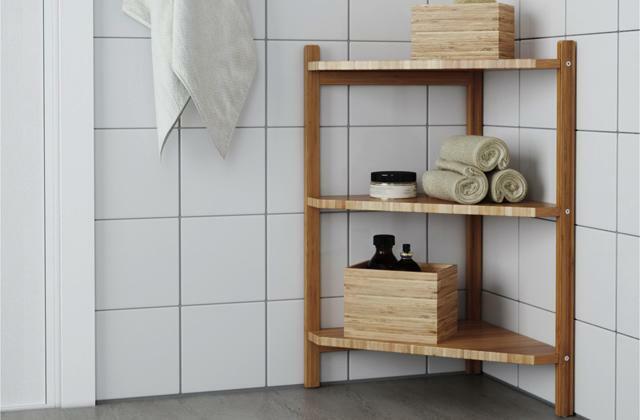 If you are the type who likes lightweight and minimalist solutions, this versatile stand is exactly what you need! It can securely hold your laptop and even cool it if needed. If you've tried to combine standing and walking during a work day, you know for sure how a standing desk facilitates this task! However, the height adjustment usually requires a lot of time and effort. 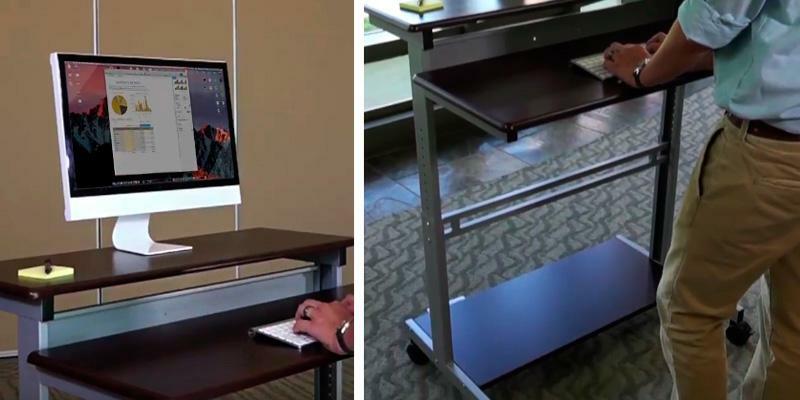 The ApexDesk Electric Standing Desk is absolutely different! You can set it at the desired level within the range of 24 to 50 inches with a single press of the button. It goes smoothly and almost doesn't wobble! A convenient extra-long cord for connecting the table to the mains allows you to organize your working space as you wish and even to rearrange it from time to time. 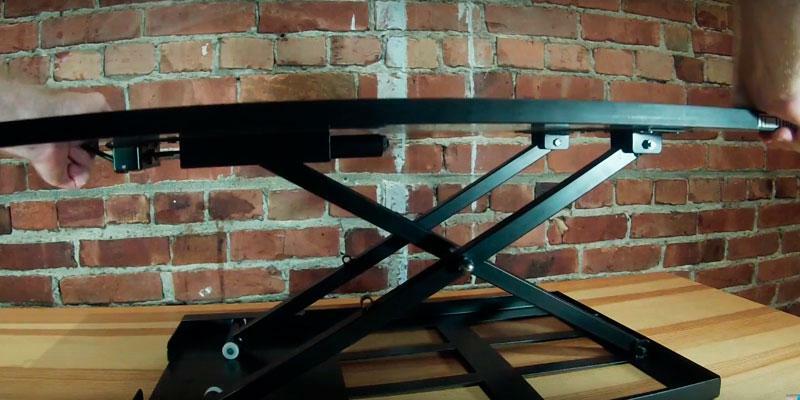 A special steel frame without a crossbar frees up space for treadmills, so if you want to double the effect by using a treadmill, the ApexDesk sit stand desk can give you this opportunity. This height adjustable desk is very stable and solid, and you can even place multiple monitors, scanners or printers on it - thanks to a steel frame, the desktop safely holds up to 225 lbs. To relieve tension in cervical vertebrae at least during sleep, use a memory foam pillow. Give it a shot, and after a few days of use, you will notice the difference. Since the desk is quite heavy, you'll need an extra assistant to assemble it. Before you begin, lay out all components on the floor and check if everything is included. 1. Assemble the frame consulting the instructions. Check the fixation - the levers should not move. 2. Together with your partner, put the frame upright and install the control box between two holders. 3. Connect motor cables to the control box, then connect a controller cable and a power cord. 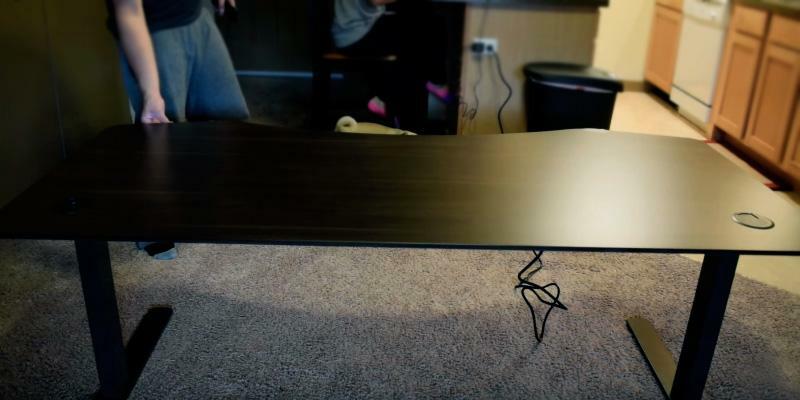 Don’t connect the cable to a power outlet until the table is fully assembled! 4. Then carefully mount the assembled frame onto a desk top. Grip the frame and put the desk in the upright position. Finally, initialize the motor following the instructions. Ta-da! Your table is ready for use! Made of high-quality MDF, the desk top meets all quality standards, including international CARB P2 certification by California Air Resources Board. 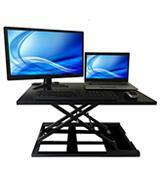 Therefore, having acquired this sit stand desk, you can be sure of its safety and environmental friendliness. We would like to point out that you can use this sit-to-stand desk not only as a workstation but also, for example, as a TV stand. Furthermore, the ApexDesk Electric Standing Desk is an excellent option if you need a comfortable desk that could be used by people of different heights. If you suffer from back pain or you seek a new way to work at the computer, not sitting all day long, a stand up desk will be the right buy. 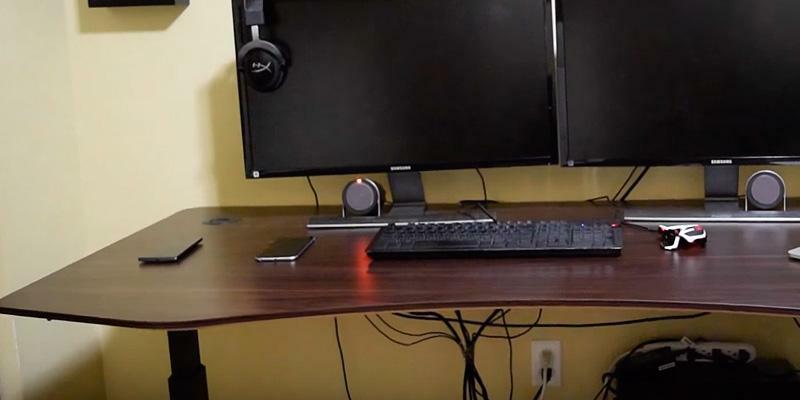 The X-Elite Pro Height Adjustable Standing Desk is a good option to consider for those consumers who have positively decided to purchase a new desk yet don't want to spend a tidy sum of money on it. The X-Elite Pro Height Adjustable Standing Desk has a compact footprint (24.5" x 16.8") to fit standard desks and cubicles and a larger desktop surface (28" x 20") to allow you to arrange on it one or two monitors, laptop, mouse, keyboard and even a cup of coffee. Since its sitting height makes only 2.5" and the standing height can be adjusted withing the range from 7" to 16" inches, the X-Elite desk comes as one of the most versatile standing desks, allowing users to switch between sitting and standing throughout a day. The great news is that it does not require additional space and comes already assembled - just take it out of the box, put on your office desk, place your laptop on it, and start to work. So, what are these benefits that we are talking about? 1. Better Heart Health. The research shows that people leading a sedentary lifestyle have a heart attack rate 54 percent higher than those changing a posture throughout a day. 2. Burning Calories. If you stand just three hours a day, you can burn 144 calories more. 3. Better Productivity. Since our body produces more testosterone and less cortisol in a standing position, we can energize, boost our productivity and improve the mood. 4. Reducing Back and Neck Pains. These are the most common complaints of office workers who suffer from sedentary work. The studies show that a standing desk can reduce back and neck pain by more than 50 percent after just 4 weeks of use. 5. Fresh Mind! You will experience less stress and fatigue and, consequently, will have more drive and stronger motivation to accomplish new tasks and achieve new goals. As we've already mentioned standing for a long time is almost as bad as sitting, so doctors strongly recommend switching between standing and sitting activities each 1.5-3 hours. The X-Elite Pro Height Adjustable Standing Desk will help you find and change a position that is ultimately comfortable for you without creating any discomfort, thanks to the quick adjusting mechanism. The height of the desk can be adjusted within a wide range, allowing consumers to customize it to their body types and heights. Making it possible for users to change positions frequently, the manufacturer has used the X-Elite Pro air pump system that allows the frame of the desk to raise and drop smoothly. To change the level of the working surface, you only need to lift the lever up or down, not moving anything else from the desk. Handy! When folded, the height between the standing desk and your working surface makes only 2 inches. Away from a computer, you may like an idea of settling yourself down in a comfy bean bag. Not have one yet? 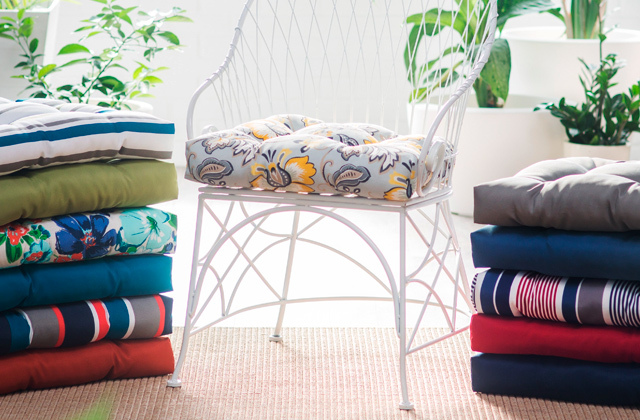 Then, you definitely need to check our comparison of 5 best bean bags available. 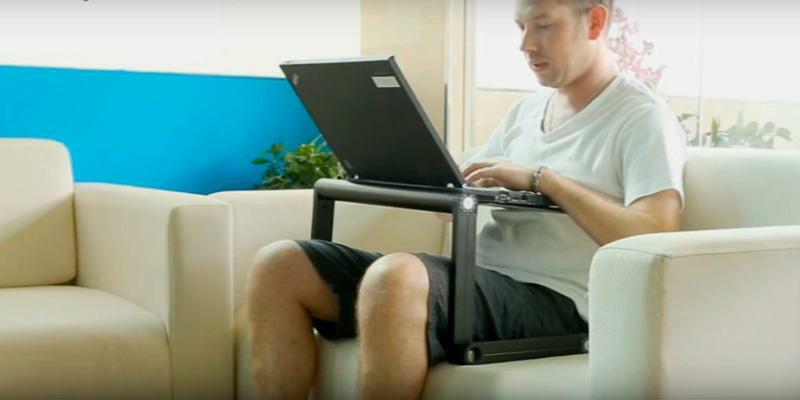 You Can be Mobile With this Desk! The minimalistic desk with a comfortable two-tier top and wheels for free movement is a real lifesaver for people who can't imagine their life without a computer but can't spend more than a couple of hours seated. The height of the desk can be adjusted at 1" increment to fit people of different heights. What we liked about this particular model is that it rests on the attached wheels that you can leave or remove when moving the table. The wheels can also be locked to stand firmly in place if you do need to keep your desk mobile. The stainless steel frame of the desk speaks in favor of the desk's reliability and its pretty high load bearing capacity. Stable, durable, functional... Two thumbs up! Why a Two-level Desk is a Great Option? Everything is simple! A two-tier desk allows your body to take the most natural position. Just as doctors recommend, it enables you to keep your keyboard and mouse at a 90° angle while standing. And if you spend at least a few hours a day at this desk, you will be able to improve (or correct) your standing posture, burn far more calories, unload spine, and relieve neck pain (because you'll no longer need to angle down your head). In addition, your eyes won't fatigue since the top of a monitor would be at or just slightly below eye level. Yet, at the end of a work day, you can feel back tension. To release it, get a super comfy gel mattress topper! 2. Do some exercises or just stretch your body at least two times a day. 3. Move! Make a new habit of walking for at least 15 minutes every two hours! Having a mini-stepper next to your desk could help a lot. 4. Accelerate! Step your way to a better shape and mood! Sometimes the simplest things work best! 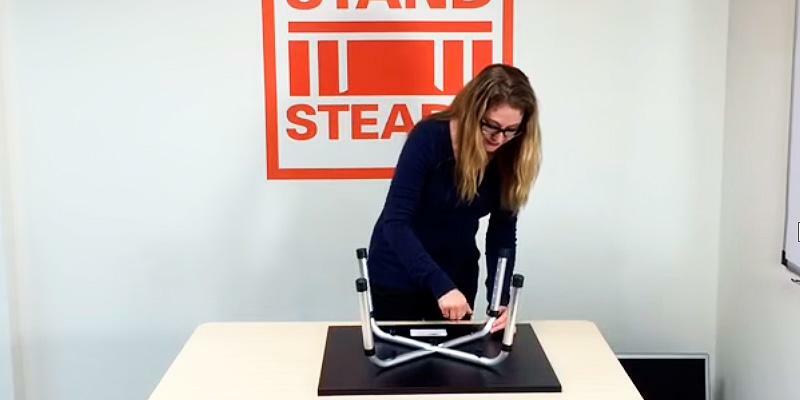 The Original Stand Steady Standing Desk is a comfortable compact option without too many extra frills! 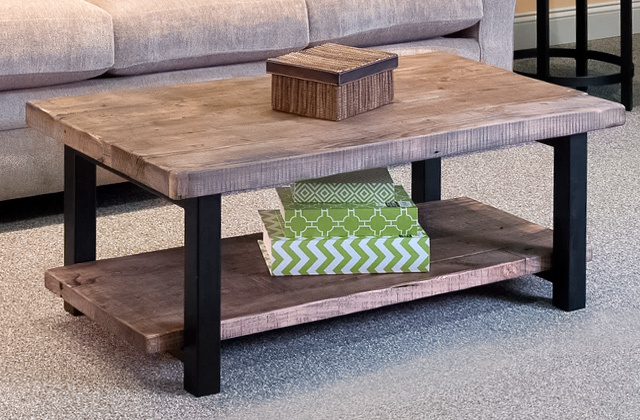 It looks just perfect as it is, matching all furniture thanks to the low-key shades of graphite colored laminate. The top of the desk features a water-resistant veneer that will let you maintain the look of your desk much longer, preventing it from soiling and staining. 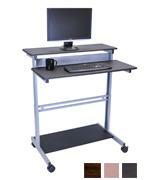 The non-skid rubber feet ensure that the desk stands firmly and doesn't play on the surface of your other desk. The assembly of the desk will require you no longer than 5 minutes. The small footprint of 18” x 15” only makes it a suitable desk for use on any standard-size desktop. The desk space it offers, however, will suffice not only for a PC monitor but also some other essentials like a mouse, keyboard, etc. The Original Stand Steady Standing Desk could actually be used in bed. If you often lay in bed with a laptop in your lap, this desk will surely come in handy. How to Assemble this Desk. To set up this desk, first place the desk top upright. Then, install the legs with the help of the mounts (included). Next, put it on your desk and adjust its height. That's all! You can start working! However, remember to change your activities (standing and sitting), and make short breaks for walking around. The experts from all over the world give advice on how people who live a sedentary life can improve a sitting posture and reduce the risk of pains by rearranging their workspace and acquiring orthopedic products, such as head pillows, massage chairs, etc. Yet, it’s very likely that you haven’t come across any of the recommendations on how it’s better to stand at the desk. Let’s cover some of the main rules that you should follow when standing at the computer. - Keep shoulders straight, with your back being aligned over your pelvis; don’t lean on the desk. - Balance your body, with your weight being evenly distributed over your feet. You’re likely to feel quite tired at first, but while spending more and more time at the desk in a standing position, you’ll get used to it and find much more comfortable than sitting. - To do some physical exercises between short breaks from work, it’d be a good idea to keep a small tool or box (or a stepper) next to the desk. - In order to reduce the load on your spine, workout your abs until you get the feel of stiffed muscles in your stomach. - Keep moving and stretching to avoid getting tired too quickly. The Executive Office Solutions desk is probably one of the most versatile models you could get to install on your working desk. 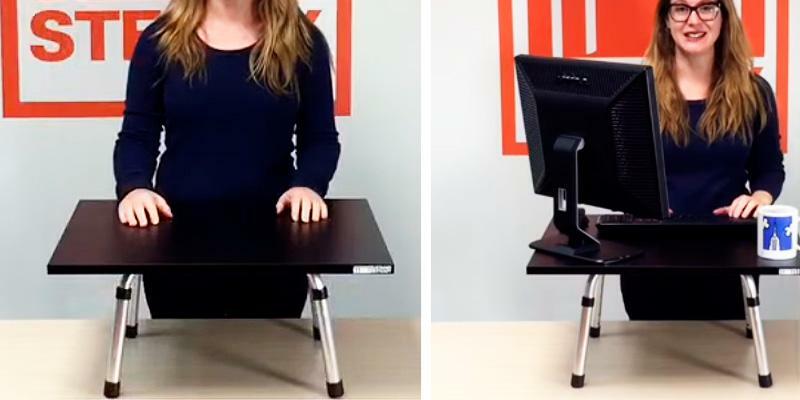 Besides height adjustment, a typical feature of all standing desks, a user can also angle and rotate it to bring it to the ultimatly comfortable level. 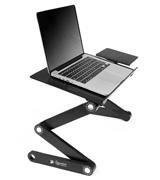 The aluminum stand features a reinforced swivel mechanism and can be folded almost flat for easy transportation. 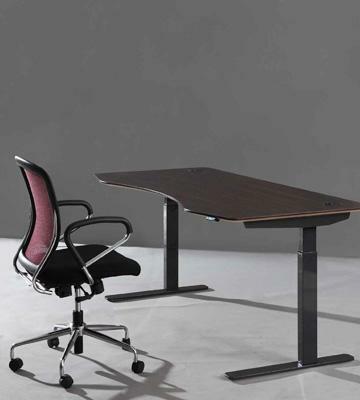 Due to the combination of plastic legs and metal body the desk is pretty lightweight yet sturdy. The presence of 2 clips on the front side of the stand will let you place your laptop almost in a vertical position, while the plastic slot in the desk will keep your mouse in place, preventing it from sliding off. Among the extras you get with this desk are two built-in fans that will cool your computer during prolong work. No need to buy a cooling pad additionally. Being incredibly compact and elegant, this standing desk converter looks more like a piece of furniture than an office fixture, and can actually serve as a TV dinner tray, writing desk, book tray, sound equipment table. Standing or Sitting for Increased Productivity? Well, it's clear that alternating between sitting and standing improves our overall health. But how do these "switches" influence productivity? According to recent studies, working in a standing position is beneficial for routine jobs and tasks that require concentration. A well-known fact is, people usually work much harder after they get up on their feet, and work actually faster if they motivate themselves not to sit down until some job is done. But the most creative solutions often come after a physical activity, so we highly recommend you to switch between standing and walking, or use a standing desk together with a treadmill. Switching to a Standing Position... What to Wait For? Sore muscles and feet. During the first week, you will feel discomfort, but after a while, your muscles will get used to a new position. Yet, your feet and joints need more time to get over standing, thus, to avoid or, at least, reduce the pain, it's advisable to purchase an anti-fatigue mat. For example, even a yoga mat can create a good cushioning. Many people prefer to stand barefoot, some wear shock-absorbing trainers, and others use usual shoes. What suits you better? To each their own. An excellent way to relax and take care of your feet is to let your feet soak in a foot bath at the end of a day after work. Laziness is killing the world! Lots of research show that sitting more than 8 hours a day can lead to a range of health issues, including obesity, spinal problems, heart disease, diabetes, and even cancer. Concerning that most Americans live a sedentary lifestyle, sitting might become "the new smoking", and only standing can help reduce the risk of health problems! A standing workstation (or standing desk) allows you to stand up comfortably while working, thus, lowering the risk of weight gain and other health diseases as well as improving your mood and even boosting productivity! Like sitting too long, there are some downsides of standing too long. We mean a standing desk won’t solve all health problems unless you remember to change your posture! So, it's advisable to alternate between sitting and standing throughout a day. A good office chair can surround you with ultimate comfort and provide a correct sitting posture. 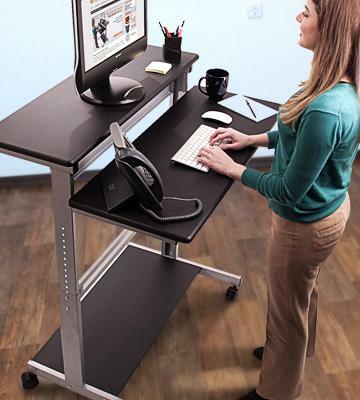 Standing desks come in different shapes and sizes, they can be full-size desks or desk converters. A full-size desk works as a traditional office desk and enables you to cram onto all essentials, it can be one- or two-tier and have a slide-out keyboard tray or an extra shelf. Such desks are quite functional, and some of them can even accommodate a treadmill if you want to compound the beneficial effects of standing and walking while you work. On the other hand, especially if you're just trying to work in a standing position, a small desk converter is a preferable option. It's pretty compact, thus, it can be placed just on an existing desk. And if you prefer working in bed, such desk is definitely your choice! It might blow your mind how many extra frills standing desks have. Some desks come with an electric height adjustment system which makes adjusting smooth, silent and very simple - just touch the “up” and “down” buttons, and you’re set. These desks are very comfortable as they can even remember several heights, however, and they are a bit pricey. 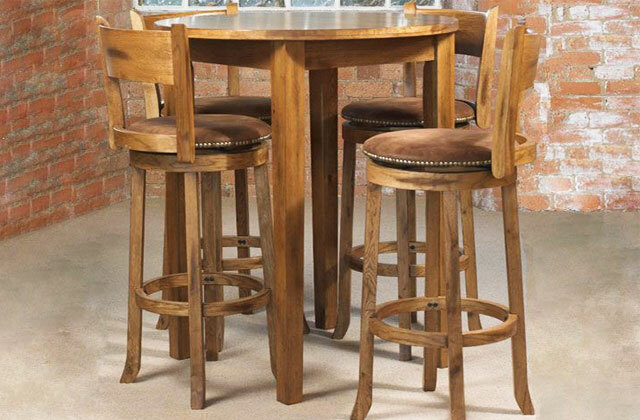 Most low-cost options are adjusted with screws and, naturally, they may require you longer time to change the height. A desk with an air pump or Lift Up Mechanism can become a good alternative out of these two options. 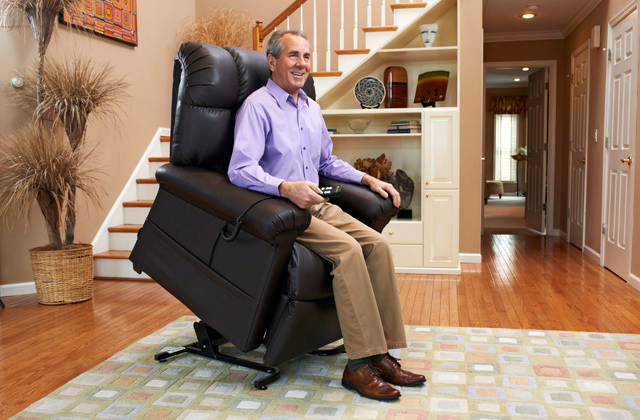 In theory, the 48″ max height is sufficient for most people up to 6′ 5″. Before making a purchase, think twice whether you are going to rearrange your office or, for example, you're planning to use a standing desk for watching movies, gaming, reading, etc. too. 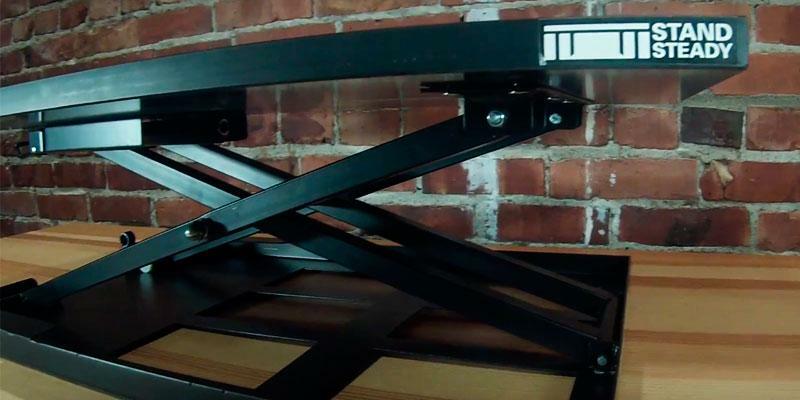 If so, a full-size table should have lockable wheels for easy transportation, while a small desk converter should be light and simple to set up. In case you plan to install a laptop with lots of hardware peripherals, it's important to check the maximum load bearing capacity, as well as the material the desk is made of. 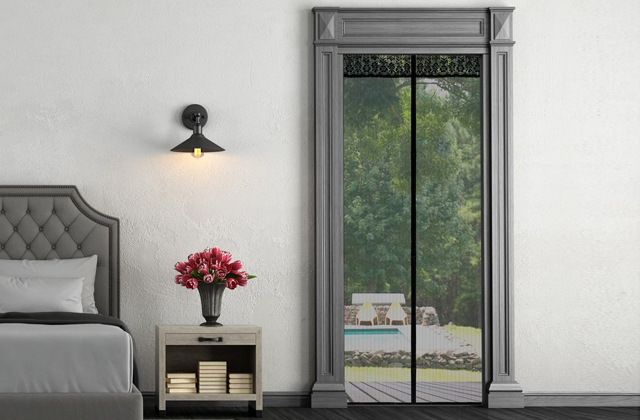 Models with steel frame are considered to be the most durable and solid. 1. Alan Henry The Complete Guide to Choosing (or Building) the Perfect Standing Desk, Lifehacker. January 28, 2015. 2. Elizabeth Grace Sauders The First-Timer's Guide To Choosing A Standing Desk You Won't End Up Hating, Fast Company. December 1, 2017. 3. Terence Lee No buyer’s remorse: a guide to getting the best standing desk for your needs, Tech in Asia. November 4, 2015. 4. 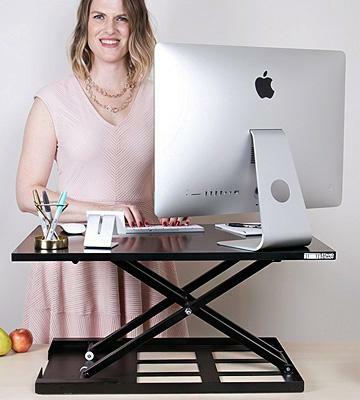 Standing Desk Buying Guide, eBay. August 22, 2014. 5. Rachel Bindl How to Get a Standing Desk in Your Office, National Business Furniture. August 8, 2016. 6. Shannon Cotton Proper Posture When Standing and Sitting, LIVESTRONG. October 22, 2015. 7. Joe Leech 7 Science-Based Benefits of a Standing Desk, Authority Nutrition. 8. Standing Desk Benefits: Are They Real? What Else Should You Do? Dr. Axe.